Spring break was supposed to start Friday. It was supposed to be a half day, and then I would have all of this coming week off. However, apparently when you have seven snow days, those week-long-break perks of being a teacher can disappear. So instead, I have two more days between me and an extended long weekend with my parents. Rather than wallow in these extra two days, I used my last weekend before Lent is over to bake for one more person at my school, that happens to be a celiac (can’t eat gluten). I had told her that I would get her some gluten free girl scout cookies from a friend, but apparently they are in extremely high demand and I couldn’t finagle a box in time. 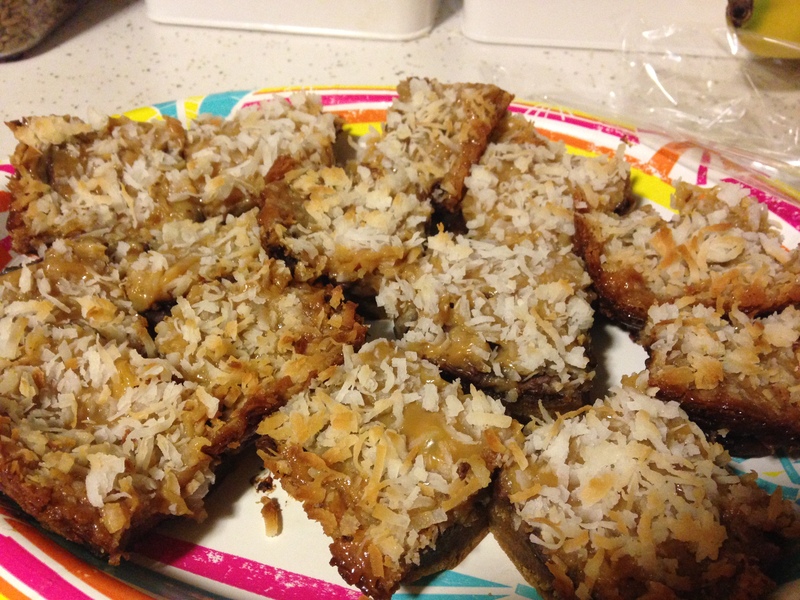 Those were chocolate chip, though, and we all know that caramel delites (samoas?) are the best of the girl scout cookies. So instead, I decided to do a girl-scout-cookie-themed gluten-free dessert for her. Now, I know I have quite a few gluten-free relatives out there reading this, so this is for all of you as well. I found them on buzzfeed, where they also had a whole bunch of other options to choose from. Definitely worth a look. First, beat the eggs in a stand mixer until they triple in size. This step almost turned me off to the recipe, because I’m always afraid of messing up with eggs, but then I remembered my trusty yellow stand mixer and gave it a whirl. Does that look triple? I think its close. It was 10 minutes. During the last minute, melt the peanut butter in the microwave for a minute. Give it a stir. While the mixer is still going, slowly pour the peanut butter into the bowl until it is well combined with the eggs. Pour the mixture into a greased 8×8 pan. I’ve never worked anything of this consistency, so I don’t know if I did it right, but it was cool and spongy in texture. Sprinkle 3/4 cup of chopped chocolate chips over the top of the mixture. I don’t really know why the chips had to be chopped, other than to make them melt a little better, but I’m not one to break the rules. 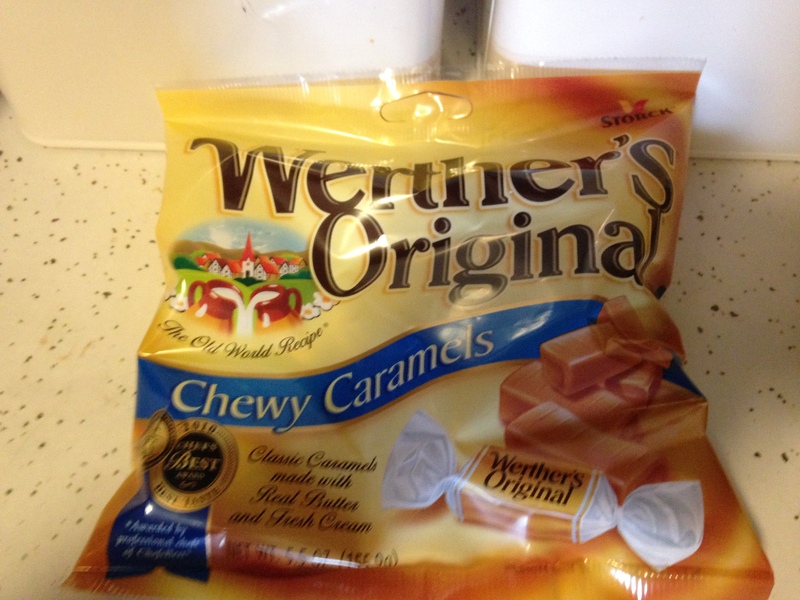 Put the butter, unwrapped caramels, and sweetened condensed milk in a saucepan. Melt over medium-low heat, stirring constantly. Now, you’re only going to use one cup of the caramel, and pour it over the chocolate layer. Anyways, sprinkle the coconut over the caramel. Bake at 350°F for 25-30 minutes, until a toothpick comes out without any kind of crumb from the egg layer. I may have overcooked at this point because the caramel tricked me into thinking the center wasn’t done, but you should expect the caramel on your toothpick. Allow the bars to cool completely in the pan before cutting. Transfer to a platter. Melt the remaining 1/4 cup chopped chocolate chips in the microwave. Whenever I melt chocolate, I go by the microwave-for-15-minutes-at-a-time-at-half-power-and-stir method. It works. 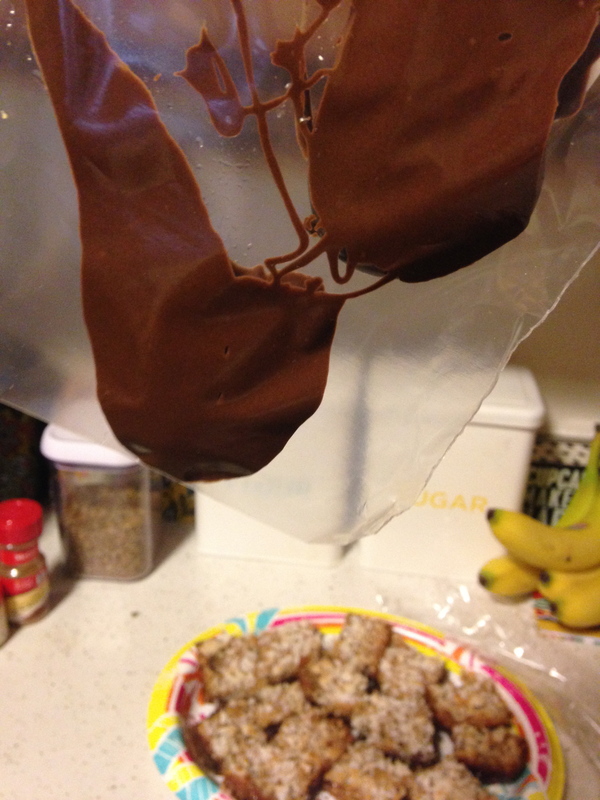 Rather than pull out a pastry bag, I just spooned the chocolate into a ziploc bag and cut the corner off. Drizzle over the bars to add a little more chocolate to the mix. I’m not really well-versed in gluten free desserts (other than flourless chocolate cake, but that’s a good dessert in its own right), but these look pretty good to me. Beat eggs in stand mixer until they triple in size, about 8 to 10 minutes. 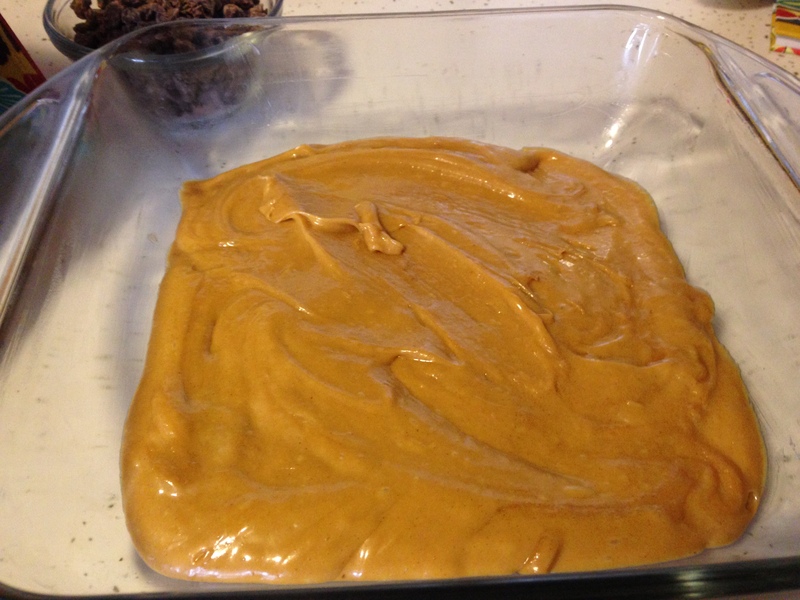 Melt peanut butter in microwave for 1 minute and stir. Pour into egg mixture slowly while beating until combined. Pour batter into greased 8×8 pan. Sprinkle 3/4 cup chopped chocolate chips on top. Set aside. To make the caramel sauce, combine sweetened condensed milk, caramels, and butter in a saucepan over medium low heat. Melt until smooth, stirring constantly. Pour one cup of the caramel over the chocolate layer. Save the rest for something else. 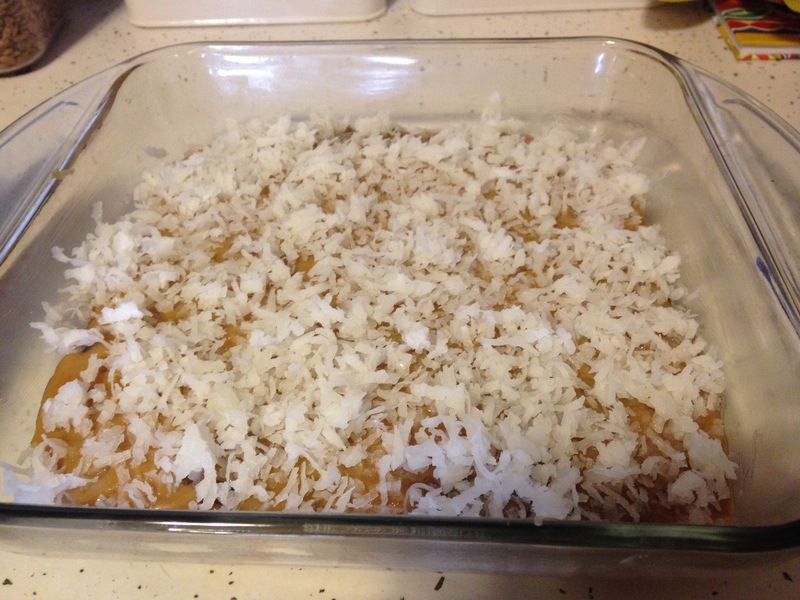 Sprinkle coconut on top of caramel. Bake at 350°F for 25-30 minutes, until a toothpick inserted in the middle comes out mostly clean. Allow to cool completely before cutting into bars. Melt the remaining 1/4 cup chocolate chips and drizzle over bars. My book club loved last weeks nightcap tart.